Tom Watts' impressive start to season continued with a maiden ton in an unbeaten record first wicket partnership for this Knockers win. He was ably assisted by Stuart Seldon with the bat and Dan Turner and Lynden Spencer-Allen with the ball. Bidborough won the toss and elected to bat first in the stilled May heat. 9 man Knockers were grateful to Turner's (11-2-24-4) opening spell of parsimony for developing a sense of belief that they might contribute to the match as captain Ben Cobb (8-0-53-0) toiled at the other end. The home team's openers stood firm until first change saw Guthrie Miller (6-0-45-2) and Spencer-Allen (6-1-15-3) quickly turn events in the Knockers' favour. Miller's canny habit of making a breakthrough was on show with a smart caught and bowled. His second wicket took the leg stump after the batsman tried one pull too many. Spencer-Allen took 3 wickets; one batsman played on, the next clean bowled and the last knicked though to the gloves of Seldon. Ken Cowan (4-0-45-1) then removed the remaining opener before Bidborough's Bennett (63) survived a drop in deep mid-wicket to begin a possible match winning partnership with a brutal knock. Turner returned to the fray and this time was rewarded for his excellent bowling with four wickets including the dangerous Bennett's. 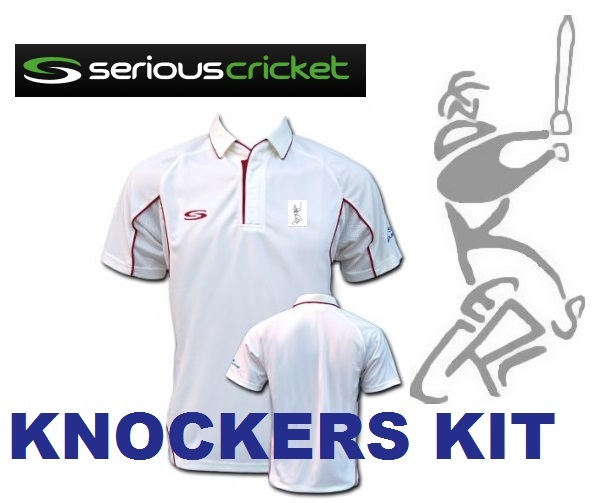 The now fully complemented Knockers outfit went into tea needing 197 to win. Watts (107no) and Seldon (82no) then set about the away team's response. Seldon's relaxed style saw him reach 50 first with only a dropped powerful drive to mid-on to worry him. Bennet then stepped into the match again with the ball and a lean spell of runs threatened to unsettle the previously prolific openers. However Watts just seemed to play himself in until in the sixties and then opened up to race to 99, taking a single to complete his near-faultless 100. The centurion finished off the match with a four to bring up the 200 that alongside Seldon's assured innings set a new Knockers' record opening partnership.